The Alpha Method, On Auto Pilot! And the software can even place your bets for you! I'm David Leslie - 55 years young with 37 years of horse racing experience, knowledge and healthy obsession! 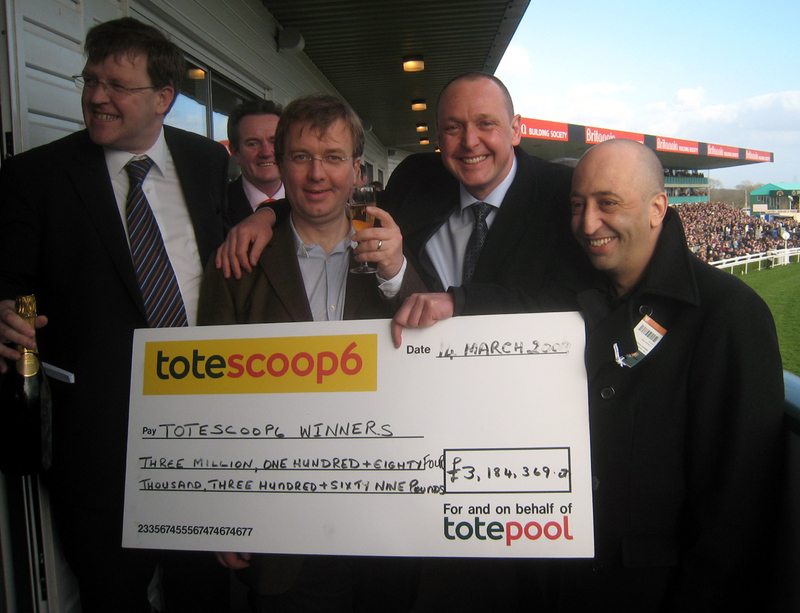 I currently run a highly successful online horse racing business - PlayScoop6, a Scoop6 Club with many members where we place large, weekly bets on the Totesport Scoop6, a jackpot pool bet which often pays hundreds of thousands and sometimes millions of pounds. In fact, I've personally won a share of a £3.2 million jackpot. I've run other successful horse racing betting businesses too. Over the years and due to the amounts I've won, I've ended up being banned by most bookmakers and even where my accounts are still open, the size of my bets is severely restricted, sometimes to pennies. So now, I focus on placing mainly forecast and tricast bets - that's where The Alpha Method I'll be talking about has produced so much success - plus some win and each way bets produced by The Alpha Method plus of course Scoop6 bets. My win and each way bets have to be placed on the Betfair exchange as the bookies don't want to take them! I'm sure this will be a familiar story to some of you! 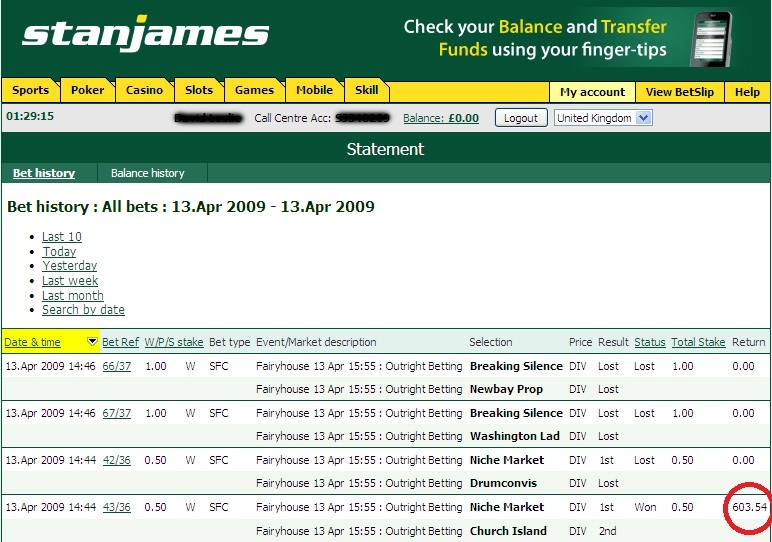 I first came across Nigel more than ten years ago when he created a superb piece of software for one of my previous horse race betting businesses. Nigel is an independent, highly experienced, well regarded professional software engineer. His accreditation includes Approved Betfair Vendor status. Many regard him as being a genius when it comes to I.T. development. 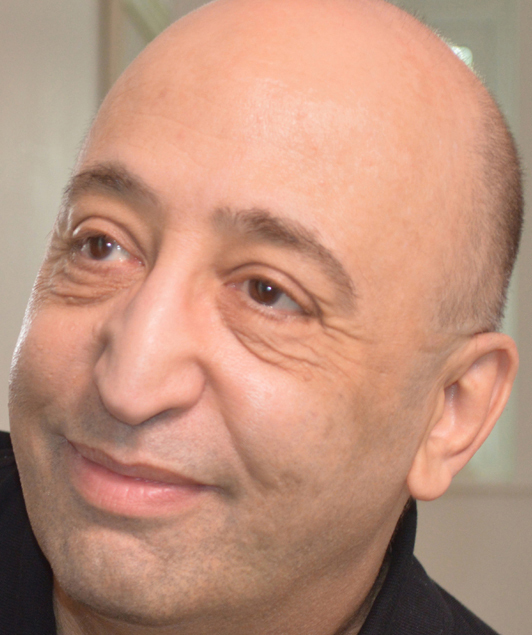 Nigel's specialty sector for software development has always been horse race betting and he has spent many years developing complex apps and bots for a whole range of customers from individuals and tipsters seeking automation through to major commercial entities. He has extensively developed products which automate betting on the Betfair Exchange. In fact, Nigel has developed software for some of the biggest names in the horse racing business including for Betfair VIPs and the likes of Geegeez and The Value Machine. 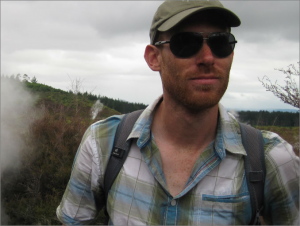 Knowing him and his work, as I did, Nigel was the obvious and logical partner to automate The Alpha Method and he is one of very few software engineers able to build software which is able to take into account all of the diverse factors that need to be analysed for The Alpha Method to work. Nigel isn't cheap but he is best of class and I've worked with him for more than a year now to develop what I'm bringing to you today. For many years, I aimed, unsuccessfully, to shoot the moon. To dream the dream. To reach for the stars. Like all of us, I didn't want to just have winners. I didn't just want to have a lot of short priced winners with the occasional winning longshot. It's a lot of hard work for not enough return. How many times did I look at the forecast and tricast returns from large field major handicap races? Like the various Grand Nationals, like so many other prestigious large field major handicaps throughout the racing calendar. Like the forecasts which sometimes paid £1,000 to a £1 unit stake. - to £1 unit stakes. I wanted to find those winning bets. I wanted them for myself. I knew I wouldn't win the National Lottery - that's just sheer luck - but I knew about horse racing, I'd been part of a £3.2 million Scoop6 win. I knew I could find winners. I just needed a more robust formula for finding the all important 2nds and 3rds too so that I could share in this dream payouts. It was out with the old and in with the new. I had to find the way to put it all together to win forecasts and tricasts. I was onto something because you see, it is ALL ABOUT which factors matter the most and then how they need to come together. But to be sure, I had to trial.....and trial....and trial it. Not a trial over a few races. Not a trial over a few months. I trialled The Alpha Method ​FOR A FEW YEARS - it had to work on the Flat, over the jumps, in UK racing, in Irish racing, in all the seasons, in all the races. I spent more than a year liaising with Nigel, explaining to him all the different factors I need to have analysed in a race and the precise ways I need those factors analysed. As a result, he has written a highly complex piece of software which does everything needed to analyse races in exactly the way I need. It has been tested, trialled and proven and it does everything I need it to do. It is set to analyse major (Class 1 and 2) handicaps throughout the UK and Ireland. That's where the The Alpha Method works best. In fact, it is childsplay. HOW IT WORKS - HOW DO YOU WORK IT? 1 - You go to a dedicated website and log on with your unique name and password. 2 - You see the selections which the software has picked, based on The Alpha Method, in any Class 1 and Class 2 handicaps running on that day (you can get the selections from around 7pm the night before). 3 - You place your bets on the selections (or you have the software place win and/or place bets for you on the Betfair Exchange and you place your forecast and tricast bets with the bookmaker)! The software looks through each Class 1 and Class 2 handicap, applies all the filters on which The Alpha Method depends and it then comes up with a number of selections (the "qualifiers"). These are the runners which are most likely to come 1st, 2nd and 3rd. Those selections are then backed in forecast and tricast bets and, if desired, win and each way bets too. IT PRODUCES WINNING SELECTIONS WITHIN SECONDS! You can even have it place ​bets for you - automatically - on the Betfair Exchange. The software will even calculate stakes for you, using the "Dutching Method" so that, if you back a few selections in a race, you will win the same return whichever horse wins the race! Like the 54,205/1 winning tricast which paid me £27,103 for a 50p stake when the prices of the winner, 2nd and 3rd were 33/1, 50/1 and 50/1. 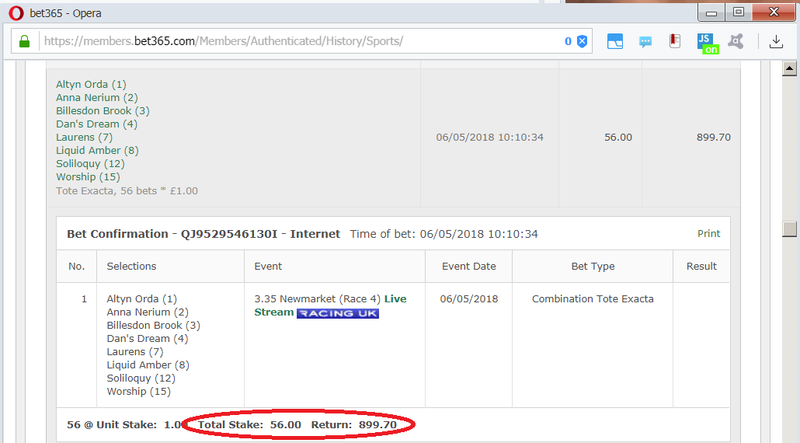 The funny story with this one is that the Statement shows a 36 pence rather than 50 pence stake because, unbeknown to me at the time of placing the bet online, Stan James limited me to 36 pence – cheeky buggers! 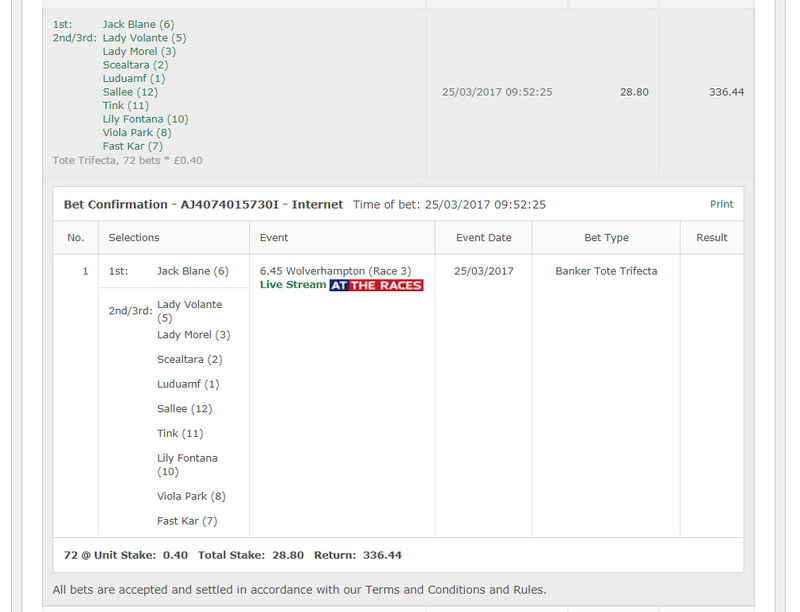 - but after a subsequent heated argument, they paid me out at 50 pence, That extra payout netted me £7,589 for a 14 pence stake! I won the argument but have been banned ever since! £620.95 for a £21 stake. Because I've lost too....obviously I have. Who hasn’t had losing bets? What idiot or liar would try to convince you they’ve won all the time? What do you think my Profit & Loss looks like? 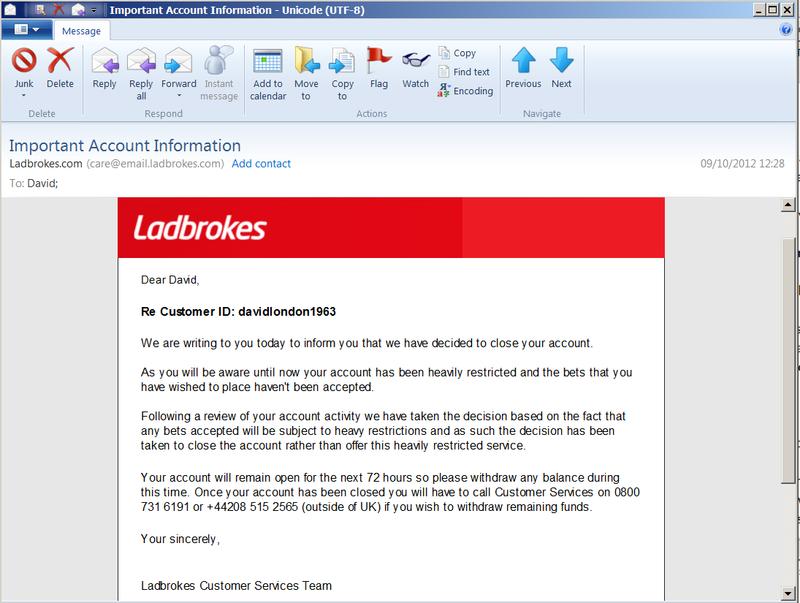 Do you think I’ve had to stake tens of thousands of pounds? So do you think I’m in the RED or in the BLACK? Do you seriously think you need to ask? 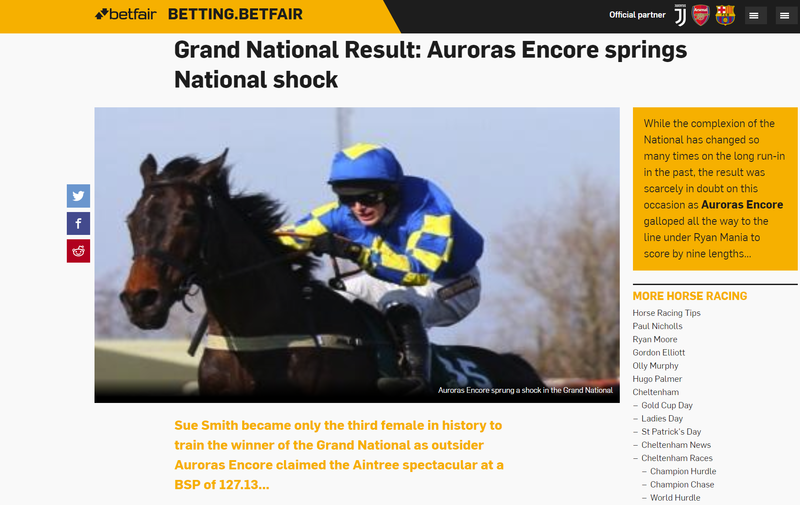 The Alpha Method won me a 54,000/1 tricast in an Irish Grand National – you’ve seen that bet receipt. In that race, the first 3 past the post came in at staggering odds of 33/1, 50/1 & 50/1. net of their 5% commission! In that race, there were, as usual, 40 runners. I placed a bunch of “banker trifecta” bets (the Totesport ‘pool’ version of the bookmaker tricast) i.e. a particular horse to win with any of a number of others to come 2nd and 3rd. One of those bets was Sunnyhillboy to win, with Neptune Collonges and Seabass to come 2nd / 3rd (either way round). In the closing stages of the race, they came round the famous “Elbow”, in exactly the order I had them – WOW! Then literally on the line, Neptune Collonges came up and won - by a nose, the shortest winning distance in Grand National history! My 1-2-3 winning trifecta ended up a 2-1-3 losing trifecta and I lost out on £69,606.30 by that nose. the 100/1 winner of the 2018 1000 Guineas (160/1 Betfair SP) backed for £15 win and £10 each way - a total of £35 staked and a return of £2,785! The method threw up two particularly high priced runners which I backed on the Betfair Exchange, one at a combined price of 49.81 (49/1) and the other at a combined price of 106.52 (106/1). High Acclaim, whose SP with the bookies was 50/1, won the race. 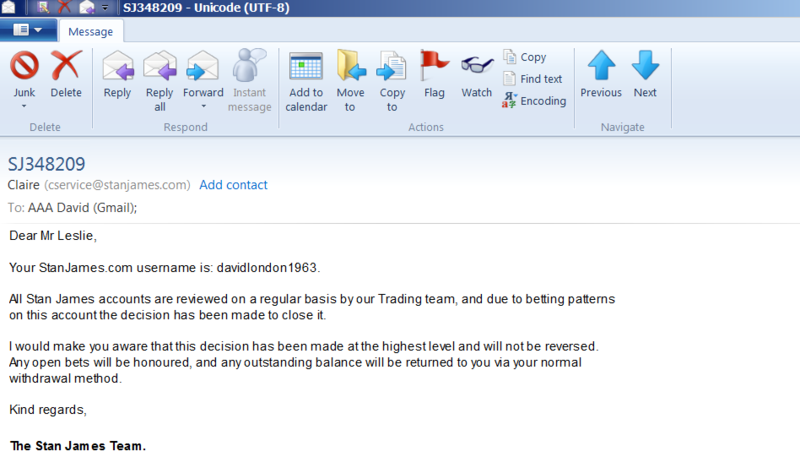 I got a Betfair price of 106.52 (106/1) but had I taken Betfair SP, the price would have been a HUMUNGOUS 162.0 (161/1). 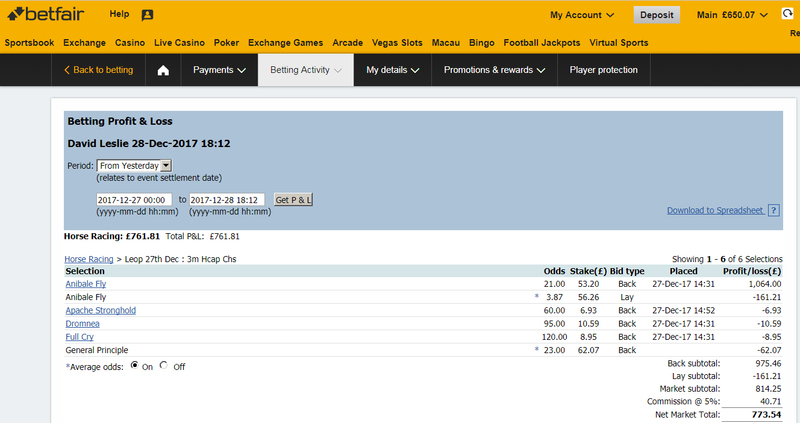 For a £17.50 stake on High Acclaim, even at the lower price I took, I made a clear profit of £1,735.78. Then in the same race, I combined all the Alpha Method selections (10 of them) for 90 x £1 Tote Exactas (the forecast) which I won. The winner's SP was 50/1 as stated and the 2nd placed horse was 14/1. For the total £90 stake, my returns were £1,355.80. Of course, forecasts and tricasts can be backed for anything from 1 pence unit stakes so, for example, had you used 10 pence unit stakes on that bet, it would have cost you £9 and returned £135.58. It's all just to scale but a profit is a profit - in fact a profit at odds of 15/1 in that example. One real standout was the 2013 Grand National. The Alpha Method threw up 6 qualifiers/selections in that race which I backed to win on the Betfair Exchange for between £10 and £25 each, taking prices on some and leaving others to Betfair SP. As you'll see from the Excel spreadsheet which Betfair have sent me, one of the selections, highlighted in red, was Auroras Encore which I backed for £25 at SP. Almost unbelievably, Auroras Encore, a 66/1 shot in the market, WON THE RACE at a HUGE Betfair SP of 127.13 (126/1). My return for that £25 stake was £3,153.35 and I almost had the tricast (which I backed separately) as two of the other selections, Teaforthree and Oscar Time, came 3rd and 4th, at 10/1 and 66/1 SP respectively. ​When The Alpha Method produces winning forecasts and tricasts, it's giving you the winner, 2nd and 3rd in a race. A silly claim of how I've won a superyacht and 3 houses! What Will You Get Out? Our betting lives revolve around this question. What will I have to put in and what will I get out? What Will You Have To Put In? To get the selections you need takes no time at all. You'll log onto the members only website, get the day's selections. Simple! No more poring over the Racing Post, no more waiting for tipsters' emails, no more having to be around at a certain time. You can run the analysis at any time, day or night (from around 7pm the day before a race). You won't need any knowledge of horse racing. Following the instructions which we provide will be enough for you to obtain the selections you need to back. They will be the horses which meet all of my criteria. “What size of betting bank do I need?" ​That is the WRONG QUESTION! If you’re asked to consider investing in a tipping service, what should you look for? ​What is their profit at level or advised stakes, at advised prices, SP or Betfair SP? What size of betting bank do I need to follow their selections so that I don’t run out of money when they have inevitable losing runs? The Alpha Method, On Auto Pilot! offers the opportunity to bet on and win forecasts and tricasts. When they win, forecast and tricast payouts will often be 100s to 1 or 1000s to 1, sometimes, 10,000s to 1. One winning tricast could pay for 1,000, 2,000, 3,000 or, in the case of one of mine, 54,000 losing bets. So should you be using the tipping service criteria to decide whether to invest? If you are worried about betting bank then you should know that forecasts and tricasts can be staked from 1 pence units. Winning dividends are declared to £1 units but yours can be anything from 1 pence upwards. 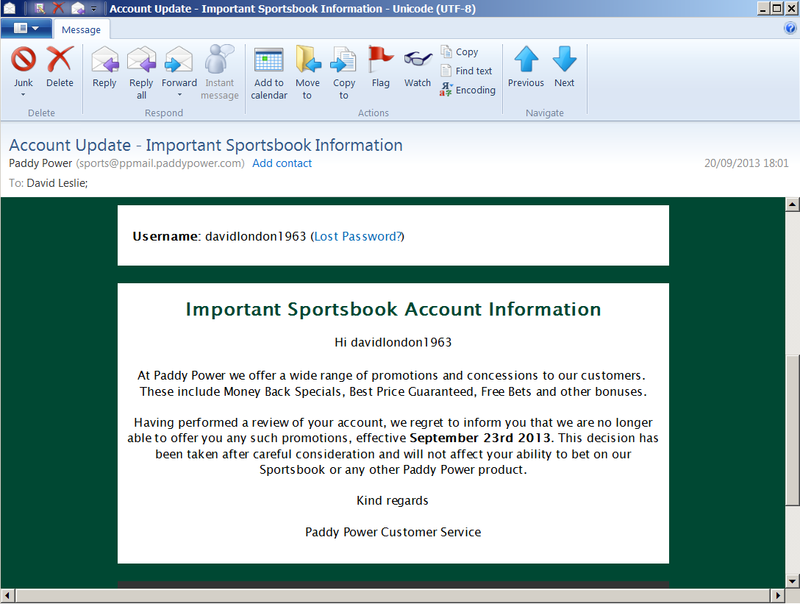 That's another reason not to worry about betting banks! Do you ask about strike rate, ROI (Return On Investment) and required betting bank before you buy a Lottery ticket? Yet you still buy a lottery ticket! It kinda makes asking questions about betting banks a bit silly, doesn’t it? With most tipsters, you'll need a large betting bank - we've seen recommendations of 5,000 points - that's where you need a £5,000 betting bank to place £1 bets on their selections. With The Alpha Method, that's just not necessary. Most tipsters will tip horses in the 1/1 (evens) to 10/1 price range. Obviously, the higher priced the tips, the less often they win and let's face it, tipsters want you to renew your subscription so they are more likely to tip shorter priced horses which win more often. The Alpha Method, ​On Auto Pilot! is, by definition, aimed at big ​​​​wins. Achievable, big wins - the very nature of forecasts and tricasts. And it comes up with lots of high priced winners in win and each way bets too. It's not only special, it's unique. Nobody else out there offers such a method. Will there still be losing runs? Possibly, especially with the better tipsters. Well I have made profits, year in and year out since 2009, using The Alpha Method - which I've proven to you (and there's more proof below). I won £27K/£28K in one race alone and I'm consistently adding to my profits. No, not with tipsters. How could you when they generally tip in the 1/1 (evens) to 10/1 price range? Yes, because the bets you'll place using The Alpha Method are high odds bets. 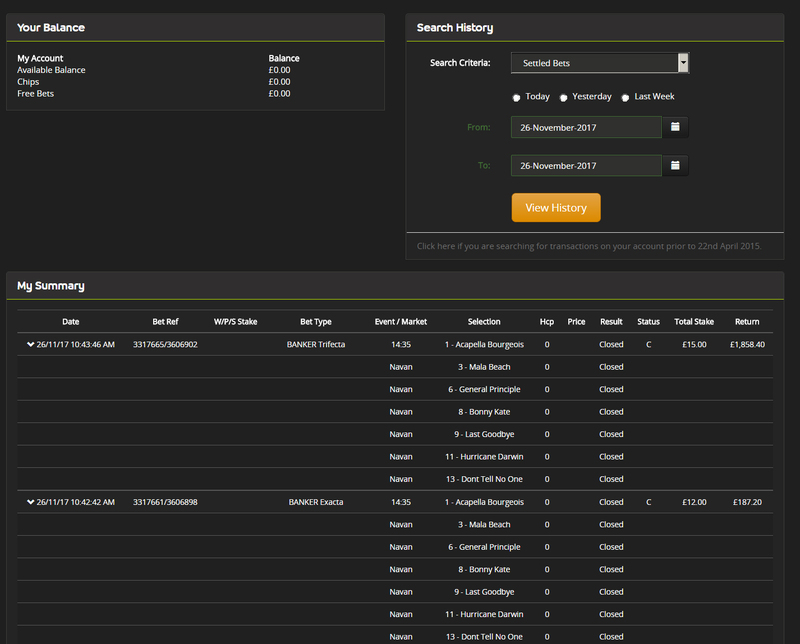 Can you select which races to bet in and find selections 24/7? Not with a tipster. They'll choose the selections and you'll have to be around when they publish them. 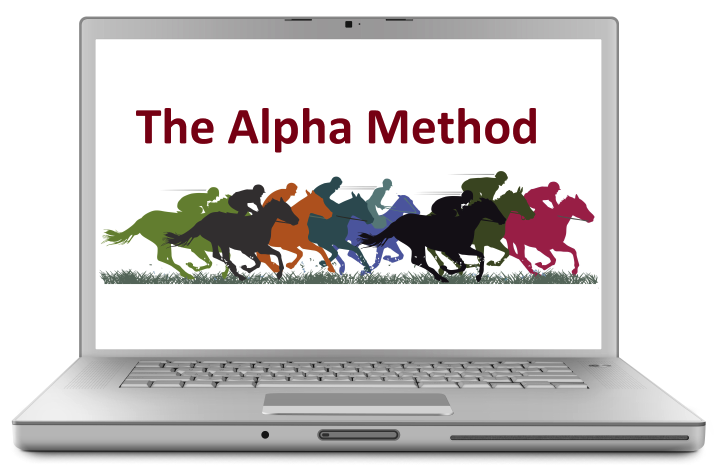 Yes, with The Alpha Method, you choose which races to bet in and the software will provide the selections for you - as a simple list. You can use the software anytime, day or night, and get your selections for the following day from 7pm the day before. With The Alpha Method, unlike with tipsters, not everyone is backing the same horses and rushing to get prices before they tumble. Will you get automatic bet placement software and have the ability to have your stakes dutched? It's highly unlikely you'll have this option with a tipping service. Absolutely yes, The Alpha Method incorporates bet placement software AND the option to choose dutched or level stakes. Will you get a chance to try before you buy? Absolutely - with The Alpha Method, you get a 2 week full access trial for just £4.99! Now, What Will You Get Out? A unique, highly researched and hugely profitable betting method. 10 years of research, 8 years of practical application, a breakout from conventional thinking, a method which is timeless and which WORKS! Full automation with complete ease of use. In today's busy world, who has the time to manually check through dozens of criteria for each of a number of races, every day? Very few of us. And that's the major advantage of fully automated race analysis and bet placement software. The ability to place worthwhile, high returning forecast and tricast bets. A proven method for winning big for small stakes. The end of having to pay subscriptions to tipsters, week in, month out and being limited to the number of bets they provide. With our method, the software provides the selections for you in a simple list format - focusing on major handicaps in the UK or Ireland - better value than any tipster subscription can offer you. Novice Friendly. A product you can use with no prior knowledge of horse racing - a product which finds the winners for you. We've spoken to some serious people in the racing world including some big, household named tipsters who will be promoting our product. After all, there's no way I personally would have invested the amount of money it has taken to bring my product to market - from very expensive software development to website development, web hosting, my own time etc. etc. - without first knowing whether it would be what people wanted. The people we've spoken to in the racing world are as cynical as they come - they've seen it all before - been there, done that, got the T-shirt - and it's a good thing that they're cynical - we've wanted honest, constructive feedback before committing our own time and money to the project. And time after time, we've had nothing but ringing endorsements - people falling over themselves asking to promote the product, at their expense, for a small share of the income (which is fine by us). "Your product is of great interest to us because it's innovative and unique - nobody else promotes a forecast/tricast service - and because you've provided the proof"
"We know that you're credible - your Scoop6 business alone has shown us that - so we know you're a serious individual, we also know Nigel from software he's developed for us, so we'd really like to be involved". "What we really like about your product is how it is web based so the people who use it can access it from any internet connected mobile, tablet or PC, anywhere in the world"
"Most tipsters get involved with all classes of race, including the low grade dross where results are very unreliable and unpredictable. What you're doing is great because you're exclusively focusing on high class handicaps which we know are the best betting medium. Continued good luck David". "Can we have this exclusively to promote?" "David, you're making so much money using your method, why sell it?" A damn good question and one I would expect you to want to ask me. Well firstly, I do personally make great money using The Alpha Method. I have done so since 2009. But I know that others can too and that makes The Alpha Method saleable. That means I can make extra money from selling The Alpha Method. Who wouldn't, in a controlled way? But that "control" means that I have to be careful to limit numbers. Otherwise, it all becomes counter productive. Many services will talk about a limit but it is often not genuine. It is a ploy to encourage sales. In this case, it is genuine. If I sell too many subscriptions, I’m going to have to register for VAT and this will mean having to increase the price by 20% which I really DON'T WANT TO HAVE TO DO. If I sell too many subscriptions, bookmakers’ prices could be affected and this will reduce profitability for subscribers. It might also reduce profitability for me in my own bets. That would be counter-productive and detrimental to users and to me. If I sell too many subscriptions so that bookmakers' prices are affected and profitability is reduced, you will be a lot less inclined to renew your software license in 12 months time. I want good feedback and good reviews and if my subscribers have a bad experience because I've sold too many subscriptions, I won't get those reviews. Before You Buy, I Need You To Know And Be Happy With What You're Getting For Your Money. I'm looking for long term subscribers so I want you to know that I've got everything covered....for your complete satisfaction. A full explanation of "Dutching"
A unique product employing a unique method. The price I was planning to sell The Alpha Method for was £199 for an annual license. I thought this would be an affordable level for most people. I said I don’t need to be greedy....I’d rather just get recognition for an amazing product and get positive feedback from people when they start making lots of money from using it. It’s an ego thing, forgive me again! At the end of your 2 week trial, you will be charged £199 for an annual 12 month subscription. 2. Click the Settings icon next to "Log out"
3. Select Preapproved Payments under "Payment settings"
Here from 2010 is a lovely Combination Tote Trifecta bet placed with Betfair at the Cheltenham Festival. A £120 stake which returned £2,276. the method found the 1st, 2nd and 3rd, priced at 5/1, 14/1 and 9/1. The winning forecast returned £101.70 for a total £7.00 stake. Betfred Classic Chase at Warwick on 11th January. Here the 1st, 2nd and 3rd were priced at 9/1, 28/1 and 9/1. A winning forecast and winning tricast, all over two days in March. What a weekend! First, a winning forecast placed with Totesport - £13 staked, £155.80 returned. Then a winning Trifecta placed with Totesport - £31.20 staked, £285.14 returned. The following day....a winning Tricast placed with Totesport - £31.20 staked, £460.04 returned. followed by a winning forecast on the Sunday - £10 staked and £172 returned. and then, in November 2017…..
in a field of only 8 runners, I had the 6/4 favourite winner, the 50/1 2nd and the 20/1 3rd. Needless to say, that was a high paying tricast - £24 staked and a £501.10 return. 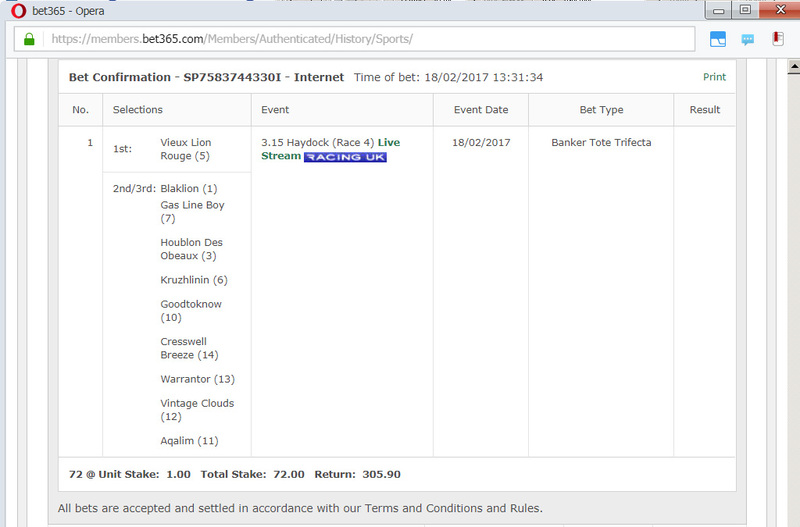 (The normal Tricast, rather than the Tote Trifecta, actually paid £1,103.62 for the same £24 stake! the winner of the Paddy Power Chase at Leopardstown, Anibale Fly. (run on 6th January 2018). In that race, where my selections correctly included the 16/1 winner, 33/1 2nd and 12/1 3rd, my winning tricast (I spent £281.40) returned £1,227.80 and my winning forecast, on which I spent £91.00, returned £631.10. As illustrated earlier, I combined all the Alpha Method selections (10 of them) in the Spring Mile Handicap at Doncaster for 90 x £1 Tote Exactas (the forecast). The winner's SP was 50/1 and the 2nd placed horse was 14/1 so it was always going to be a big forecast. For my total £90 stake, my returns were £1,355.80. The 1000 Guineas where I had £15 win and £10 each way on Billesdon Brook at 100/1. In fact, its Betfair SP was 161.0 and in running, it went to 1000 on Betfair! This was the highest priced winner in the history of the 1000 Guineas! I also pulled off the Tote forecast (Exacta) and with the 1st 2 past the post being 100/1 and 7/1, that paid out £899.70 to £1 unit stakes (total £56 staked).